Radha Baba (1913-1992) was a devotee of Mahaprabhu and Radha-Krishna who lived in Gorakhpur. Born in a Vaishnav Brahmin family in Gaya, he became an Advaitin sannyasi, but later took the path of Braj devotion. 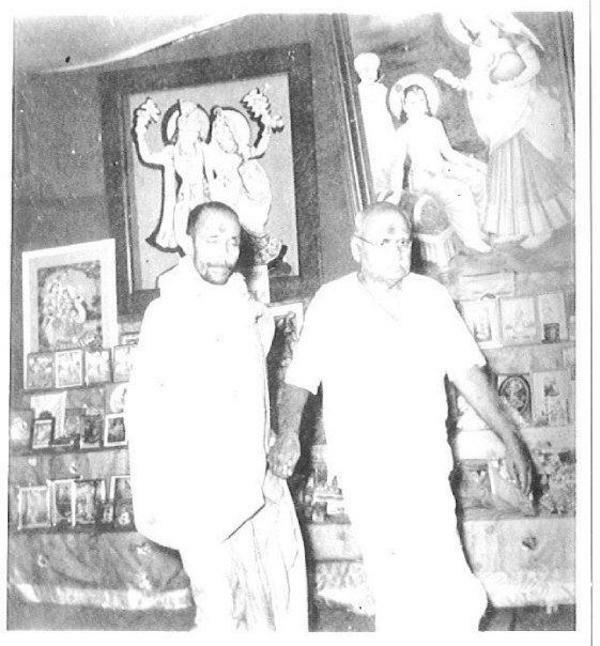 Shri Hanuman Prasad Poddar, the founder of Gita Press, was his inseparable spiritual companion. It is said that Radha Baba spent fourteen years performing a very strict maun vrat, during which he kept complete silence, without even using gestures to communicate. During this period he was completely absorbed in Braj Lila. Several beautiful books were written by him, including Keli Kunj, Satsang Sudha and Mahabhaga Brajdeviyan. The following excerpt is taken from his book Easy Steps to Eternal Vrindavan, translated into English by Lakhpat Rai, M.A. It appears to be out of print, but the original Hindi edition, Prem Satsang Sudha Mala, is still available from Gita Press, as are his other works. 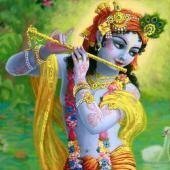 The only source of all the lilas of the Lord is Shri Radhikaji alone. She is the enrapturing energy of Shri Krishna. She is His very Self. Assuming unlimited forms, She sees to the propriety of Shri Krishna’s lilas. The prem lila of Shri Radhaji is so exalted that, really speaking, he alone can see it, to whom She wishes to show it through Her Grace; there is no other way at all. She exists even today and whatever you desire, She can fulfill at that very moment and in that very manner. What Shri Krishna is, the same is Shri Radha. Between them there is not the very least difference of any kind whatsoever. I will tell you a true incident that happened in Braj. Three high-souled men were roaming about. While doing so, one of them, who was somewhat advanced in age, got tired and said, ‘Dear brothers, you may proceed; I shall, however, rest here only.’ All the three of them had taken no food at all throughout the day. So one of them stayed behind and the other two proceeded on. Barsana was approaching. Both of them were full of faith. After consulting each other, both of them decided that they should be the guests of Shriji (Shri Radhaji) for the day. As the above conversation had taken place in a humorous mood, they never thought of it again. Later they thought to themselves – night has now fallen, where shall we go to beg for food? After partaking of whatever prasad (food offered to the Deity) we may get in the temple tonight, let us drink our fill of water. The two men heard this, and remembered their humorous conversation. Soon they became submerged in love and they answered, ‘Perhaps it is us?’ After that, the preist took them along with him and, with great affection, fed them to their fill with the most delicious prasad. Filled with love, they partook of the prasad with great delight and feeling fully satisfied, they left the temple and took rest in a pavillion nearby. After they had gone to sleep, both of them had a similar dream at the same time. The girl said, “But in the prasad tonight there were very nice betel leaves (paan). The priest forgot to give them to you. I have come with those very betel leaves.” Saying so, she placed a pair of betel leaves seasoned with lime and catechu, etc., near each one of them. Just then the two of them woke up and, getting up, they saw that there were actually two betel leaves near each of their heads. Both of them started shedding tears and became agnonized with love. Placing the betel leaves in their mouths, they became beside themselves with love. Each of them related his dream to the other. Both of them had one and the same dream at the same time. This is a true incident, and the individuals who had this experience are perhaps still alive. [Editor’s note: I have heard in Vrindavan that this incident refers to Radha Baba himself, and his spiritual companion Shri Hanumanprasad Poddar] Shri Radha Rani and Shri Krishna looked to their faith alone, and then giving them food to their fill, They accepted them in the form of guests. Similarly, They can offer Their hospitality to a person, making him Their guest, who wishes to have Their blessed sight with a real faith, and who wishes to be blessed by seeing Their lila. To Them, all are equal and there is no partiality towards anybody. Therefore, if you pray to Shri Krishna and Shri Radha Rani with an exclusive and impatient mind, ‘May I constantly think of You. May I be able to listen to Your lilas all the time – that is all,’ take it as true that there will be no delay in it. They will surely listen to this prayer, but only when the prayer is sincere. So long as your prayer is not sincere, till then go on repeating it even with an insincere mind. They can convert even an insincere prayer into a real one in due course. Your desire that you should be able to have a constant remembrance of Shri Krishna and to listen to the lilas is an excellent one. This is the very best desire. Just go on desiring, be it sincere or insincere, go on desiring alone. If the desire persists, eventually it will become real too, and some day or the other, full grace will surely manifest.